Hepatoma Res 2019;5:4.10.20517/2394-5079.2018.77© The Author(s) 2019. 1Department of Radiation Oncology, Sylvester Comprehensive Cancer Center, University of Miami, Miami, FL 33136, USA. 2Department of Medicine, Division of Hepatology, University of Miami, Miami, FL 33136, USA. 3Department of Medical Oncology, Sylvester Comprehensive Cancer Center, University of Miami, Miami, FL 33136, USA. 4Department of Radiation, Sylvester Comprehensive Cancer Center, University of Miami, Miami, FL 33136, USA. Correspondence Address: Dr. Lorraine Portelance, Department of Radiation Oncology, Sylvester Comprehensive Cancer Center, University of Miami, 1475 NW 12th Ave, Room D1500, Miami, FL 33136, USA. E-mail: lportelance@med.miami.edu . Patients with hepatocellular carcinoma (HCC) often present with underlying liver disease and significant comorbidities, limiting treatment tolerance. 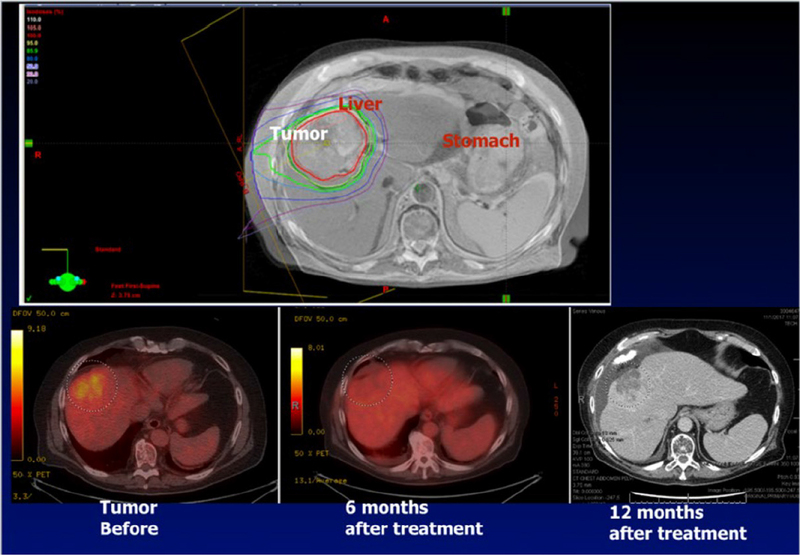 With the development of improved toxicity models and highly conformal radiation delivery systems, external beam radiotherapy has become a valuable treatment option for liver cancer. Using cutting edge technology, stereotactic ablative radiotherapy (SABR) allows for the delivery of ablative doses in few fractions while sparing uninvolved liver tissue. This approach permits dose escalation and precise tumor targeting with minimal risk of radiation induced liver disease. This review clarifies SABR’s role alongside liver-directed treatments such as radiofrequency ablation, transarterial radioembolization, and transarterial chemoembolization in the management of HCC. It also examines the promising potential of SABR combined with immunotherapy to treat advanced HCC. Hepatocellular carcinoma (HCC) is the fifth most prevalent cancer worldwide and the second leading cancer-related cause of mortality. Incidence in the United States (US) has risen dramatically over the past two decades and is now estimated at 25,000 new cases each year. In US, patients diagnosed with HCC have a poor prognosis, with mortality nearly doubling in recent decades and a 5-year survival rate less than 30%. Patients with HCC often present with a large tumor burden on a background of cirrhosis and hepatic decompensation, complicating treatment tolerance[4,5]. Prognosis of HCC depends on stage at presentation as well as overall liver function. Surgical resection is considered the first-line treatment for non-cirrhotic patients. Preoperative criteria such as Child-Pugh (CP) classification have been developed for risk stratification to minimize postoperative hepatic decompensation and prevent futile interventions. Contraindications to resection include major vascular invasion, portal hypertension, large multifocal lesions, extrahepatic disease, CP class B/C (CP-B/C) or inadequate liver remnant. Predicted liver remnant must be in the range of 40% of preoperative total liver volume or 700 cm3 for a patient to be considered eligible for resection. More than 70% of HCC patients have portal hypertension and cirrhosis at diagnosis, making them ineligible for liver resection. Orthotopic liver transplant (OLT) is an alternative for patients who meet the Milan criteria (a single tumor < 5 cm or up to three tumors < 3 cm without vascular invasion or extrahepatic manifestation). Patients who are not candidates for tumor resection or OLT may be candidates for liver-directed therapy. Liver-directed therapies can be grouped into the following broad categories: intra-arterial treatments (radioembolization, chemoembolization, bland embolization), percutaneous approaches [radiofrequency ablation (RFA), microwave ablation, focused ultrasound, ethanol ablation, electroporation] and external beam radiation therapy (EBRT). EBRT can use three-dimensional (3-D) conformal techniques for palliation or more advanced strategies such as stereotactic ablative radiotherapy (SABR) or particle beam therapy for definitive treatment. Historically, EBRT (delivered mostly by 3-D conformal technique) had been considered ineffective in the treatment of HCC since the dose required to cure HCC far exceeded liver tissue tolerance to radiation therapy. Advances in EBRT techniques with SABR and particle beam therapy in the past two decades have allowed clinicians to deliver much higher doses with significant sparing of uninvolved liver, increasing local control while minimizing the risk of radiation induced liver disease (RILD). The major advantages of EBRT are non-invasiveness and the ability to treat the majority of patients with localized liver disease who are not candidates for surgery/transplant, arterial-directed therapy or ablative therapy. Multiple centers around the world have reported long-term outcomes with excellent local control, survival and acceptable toxicity profiles. Table 1 summarizes prospective trials showing that SABR is an excellent option for HCC tumor control with limited toxicity. Recent National Comprehensive Cancer Network (NCCN) guidelines list EBRT as a locoregional treatment option for patients who are not candidates for surgery/transplant or who are waiting for transplantation (bridge to transplant). SABR, also called stereotactic body radiation therapy, is an advanced form of EBRT that combines tumor/organ motion management and multiple beams of high energy photons to deliver very high doses of radiation precisely to a small target volume over a short treatment course. In US, SABR is delivered in one to five fractions but can be more fractionated in other countries. SABR effectively treats primary and secondary malignancies in the liver, lung, bone, spine, and pancreas. When applied to malignant and benign disease of the central nervous system it is also referred to as stereotactic radiosurgery. Radiation treatment for liver cancer can be challenging because (1) tumors tend to be large and complex, requiring high doses for control; (2) underlying liver is usually compromised from liver disease and vulnerable to decompensation from radiation toxicity; (3) nearby organs such as small bowel, heart, stomach and gallbladder cannot tolerate high-dose radiation; and (4) inter-fraction (day-to-day) variation of tumor size and intra-fraction (during treatment) tumor and organ movement with respiration can be significant. SABR uses a variety of strategies to overcome these challenges during the simulation, planning and radiation delivery phases of treatment. During simulation, the reference conditions for future treatment are determined. The patient is positioned supine on a computed tomography (CT) tabletop similar to the treatment couch surface used in radiation delivery. Immobilization aides, such as an alpha cradle or vacuum lock, help to ensure the most precise positional reproducibility consistent with patient comfort. Motion management starts with acquisition of high resolution 3-D and 4-D CT scans during simulation to quantify tumor and organ intra-fraction movement. Intrahepatic fiducial markers are sometimes used to assist in localization of tumors poorly visualized on diagnostic CT scans. These small metallic radiopaque markers are inserted in the vicinity of tumor, placed percutaneously under local anesthesia at least three days prior to the simulation. In selected centers, where latest generation approaches allow for magnetic resonance imaging-guided (MRI-g) SABR, a planning MRI scan is performed in addition to the planning CT [Figure 1]. When MRI-g is available, patients forego fiducial placement. While MRI-g SABR represents a promising advance, most patients treated for HCC with radiation receive photon therapy using CT-based techniques. The simulation scan is transferred to a computer planning system and fused with available diagnostic imaging such as positron emission tomography, CT or MRI. The radiation oncologist then delineates tumor, uninvolved liver parenchyma and adjacent normal organs in the computer planning system. Due to the liver’s proximity to the diaphragm, this process must account for liver and organ motion across the breathing cycle. One option is to add a security margin around the tumor equal to its cephalo-caudal motion measured on the 4-D CT simulation scan. The downside of this approach is that a larger volume of surrounding normal tissue will receive radiation during treatment delivery. Motion management strategies such as abdominal compression, breath-hold technique and respiratory gating enable sparing of liver parenchyma, an important end-point among HCC patients with cirrhosis[14,15]. Abdominal compression restricts physiologic organ motion, while breath-hold and respiratory gating permit radiation treatment in only a single phase of the breathing cycle. Prior to each treatment delivery, an X-ray or CT scan is performed to align patients to the simulated treatment position. Fiducials, which can be seen on these images, assist in target localization. This process of alignment is called image-guided radiation therapy (IGRT). Once alignment is complete with millimeter accuracy, the radiation is delivered. Currently most IGRT is performed using X-ray images or CT scans with or without fiducial markers. Together, custom immobilization, respiratory management and IGRT help to minimize the tumor’s security margin[16-18]. The latest generation of IGRT allows for the use of MRI, which offers continuous and high-resolution 3-D images of tumor and normal organs during treatment. IGRT with MRI, currently available at a handful of centers, offers much higher accuracy compared with traditional IGRT approaches. Treatment units equipped with on-board MRI permit real-time tracking of the tumor (on-board monitoring with four MRI images per second). Target visualization can be further improved using gadoxetate contrast. Safety mechanisms turn the beam off when the target transgresses the tracking volume, making it very safe to deliver high doses to tumor with tight margins, sparing adjacent organs-at-risk [Video 1]. Proton beam therapy offers theoretical advantages over photon therapy due to sharp dose fall-off at a specific depth (Bragg peak). Due to this beam characteristic, proton SABR could lead to improved normal liver sparing compared to conventional photon treatments. This comparative reduction in mean liver dose gives proton SABR the potential to escalate dose or increase target size[20,21]. Dosimetric studies suggest that proton SABR is more effective than photon SABR for dome and central tumors ≥ 3 cm, and for tumors > 5 cm when photon therapy cannot meet dose constraint objectives. Such advantages have yet to be validated clinically. A national cancer institute-sponsored phase 3 prospective randomized trial (NRG GI-003) is underway, comparing proton vs. photon SABR for unresectable HCC using either 5 or 15 fractions. While few radiation oncology centers in the world currently have the ability to treat patients with proton therapy, 80 proton facilities are in development in US. As the number of proton centers equipped with respiratory gating continues to increase, proton SABR will become more widely available. The safety of SABR allows the radiation oncologist to prescribe a very high dose per fraction. Prescriptions in the range of 50 Gy in five fractions can be delivered safely to the target. A high radiation dose delivered in few fractions produces much greater biological effect than the same dose delivered over a protracted regimen. For this reason, 50 Gy delivered in 5 fractions has an ablative, tumoricidal effect while 50 Gy in 25 fractions is associated with low tumor control probability for HCC[23,24]. Compared to other liver directed therapies, SABR has the additional advantage of being minimally-invasive. It can be delivered to lesions regardless of adjacent vascular structures, vascularity of the tumor, associated venous thrombus, or location within the liver. In contrast to more invasive liver-directed therapies, SABR can be used to treat patients at high risk of bleeding, a clinical situation frequently encountered in the cirrhotic patient population. It can also be used to simultaneously target enlarged portal nodes or portal vein tumor thrombus. An example of SABR target and dose distribution, as well as tumor response on post-treatment imaging, is shown in Figure 1. SABR is often used to treat liver lesions beyond the capabilities of other local, ablative techniques: large volume tumors; lesions near the liver capsule, major vessels, or diaphragm; and disease complicated by portal vein tumor thrombus (PVTT). HCC tends to invade the portal vein causing PVTT, especially in patients with advanced disease at presentation. If untreated, overall survival (OS) after PVTT diagnosis is 2.7-4 months. SABR can re-cannulate the portal vein, facilitating subsequent embolic therapies for which the presence of PVTT is a relative contraindication. In this setting, SABR used in combination with embolic therapies increases patient OS. Although SABR is a liver directed therapy most frequently used for patients who are not candidates for surgery or OLT, it can also be used as a bridge procedure to downstage lesions that do not meet the Milan criteria or to prevent disease progression while patients are on a waiting list for OLT. Published clinical series demonstrate that SABR is a safe and well-tolerated procedure when used as a bridge to transplant. In 2011 O’Connor et al. evaluated a clinical series of 10 patients with 11 HCC lesions treated with SABR while on the OLT waiting list. Local control over this period was 100% and all patients underwent OLT without increased surgical complications. In another phase I study, a 27-patient subgroup treated with SABR as a bridge to transplant had a 100% local control rate. Alternatives techniques used as bridge procedures to transplant include RFA and transarterial chemoembolization (TACE). RFA, a commonly employed percutaneous technique in HCC treatment, involves the insertion of a monopolar or bipolar probe into targeted liver tissue, using frictional heat generated by alternating current to destroy tumor via coagulative necrosis. With RFA, best outcomes occur when the lesion is less than 3 cm in diameter, distant from large hepatic vessels that divert heat from the intended target, and with at least a 1 cm margin from adjacent organs such as bowel to avoid injury to critical structures. RFA is an invasive procedure often requiring general anesthesia. Intra-arterial embolizations such as TACE are primary treatments for HCC patients with unresectable tumors and CP-A or B hepatic function who do not meet transplant criteria and cannot receive local ablation. In bland transarterial embolization, micron-sized particles are delivered into the tumor vasculature to decrease blood supply to the tumor and induce necrosis through hypoxia; in TACE, a chemotherapy agent infused into the region of interest remains sequestered due to subsequent microparticle embolization, potentiating cytotoxic effects. Absolute contraindications to TACE include tumor involving more than half the liver, renal insufficiency, extrahepatic disease, reduced portal flow, or poor prognosis indicated by hepatic encephalopathy and jaundice. In 2017 Sapisochin et al. first compared SABR (n = 36) with TACE (n = 99) and RFA (n = 244) as bridges to OLT in patient with HCC. The study found that SABR, while treating a greater tumor burden than RFA, demonstrated similar post-transplant survival and recurrence rates as the other techniques. In cases of borderline ineligibility for transplant, SABR is a logical option for downstaging HCC, as it is less invasive than surgery, RFA or TACE and provides comparable survival outcomes[33-35]. A recent study comparing SABR to resection in patients with CP-A disease and lesions ≤ 5 cm in greatest dimension reported comparable OS with fewer complications in the SABR group. A 2015 University of California San Francisco study recommended an individualized approach to the choice of locoregional therapy for downstaging, determined case-by-case at a multidisciplinary tumor board. The multidisciplinary model has been shown to improve HCC patient outcomes. Treatment algorithms corresponding to clinical stages of HCC continue to evolve. There is increasing recognition that spatial cooperation with combination therapies can improve patient survival. Among all treatments for HCC, only palliative systemic agents sorafenib and regorafenib are supported by category 1 evidence. Surgical, ablative, intra-arterial and external beam approaches rely on consensus support from oncologists based on category 2 evidence. The 2017 US NCCN guidelines emphasize the ability of SABR to treat HCC at any location in the liver. NCCN considers SABR an appropriate alternative to ablation/embolization techniques. This recommendation is supported by a bulk of published data including the retrospective studies comparing SABR with RFA and TACE. A 2016 retrospective study by Wahl et al. compared SABR (63 patients treated with 27-60 Gy in 3-5 fractions) to RFA (161 patients), showing these two modalities to be equally effective for the treatment of inoperable HCC < 2 cm, with SABR providing better local control than RFA for lesions ≥ 2 cm. Another retrospective series that compared TACE and SABR reported that 2-year local control was significantly better for SABR, 91.3%-22.9% with no significant difference in OS. While SABR is most often used to treat tumors ≤ 5 cm and 1-3 liver lesions, it can ablate more extensive disease provided radiation constraints and liver remnant limits are met. In Princess Margaret Hospital (PMH) phase I and II trials, Bujold et al. reported the ability of SABR to accommodate an increased tumor burden. While the PMH multivariate analysis revealed that gross tumor volume was unrelated to treatment outcome, other studies report significantly better local control when using SABR on tumors < 5 cm[42,43]. SABR also can serve as second-line therapy when alternatives are contraindicated or have already failed. In the PMH trial, SABR was used to treat 102 patients with advanced HCC, ineligible for surgery, TACE or RFA. Median tumor diameter was 7.2 cm, more than half the cohort had PVTT and 12% had distant metastases. Despite this heavy disease burden, patients receiving a median dose of 36 Gy (range 30-54 Gy) in 6 fractions had a 17-month median OS and one year local control rate of 87%, superior to historical controls for sorafenib (6.5-10.7 months OS) and supportive care (4.2-7.9 months OS). Andolino et al. reported results of a phase I dose escalation study in which 36 patients with CP-A disease received 48 Gy in 3 fractions while 24 patients with CP-B disease received 40 Gy in 5 fractions. Two-year local control was 90%, 2-year OS was 67%, and median time to progression was 47.8 months. While SABR is a minimally invasive, external beam radiation platform with precise dosimetry able to reliably target subsegmental lesions, transarterial radioembolization (TARE), also known as selective internal radiation therapy is often used to treat large multifocal disease impossible to address with SABR techniques. TARE can deliver very high local doses of radiation to HCC involving entire segments of the liver with a single invasive procedure. Published data support the use of both modalities, and no direct comparison has been attempted through clinical trials. The decision to use TARE or SABR is institution specific, based on disease distribution, co-morbidities and multidisciplinary tumor board consensus. TARE is an ablative radiation technique that involves injection of radiolabeled yttrium-90 (Y-90) microspheres into the hepatic artery by guided catheterization. Isotope-containing microspheres lodge in arterioles feeding liver tumors, embolize the small vasculature and deliver very high, tumoricidal doses (estimated to be 85-120 Gy and even higher in cases of TARE segmentectomy 300-400 Gy). TARE selectively targets disease by exploiting the liver’s dual blood supply: tumors greater than 3 cm in size are fed primarily by the hepatic artery while the liver parenchyma’s main source of blood supply is through the portal vein. Y-90, a beta-emitting isotope with a half-life of 2.67 days, is packaged in glass (Theraspheres, BTG Canada) or resin (SIR-Spheres, Sirtex Australia) particles. Spheres with diameters between 20 and 60 microns occlude arteries feeding the tumor proximal to arteriovenous anastomoses, sparing central venules from toxic doses. Central vein obliteration is characteristic of RILD, so precapillary entrapment combined with short-range activity accounts for low rates of radioembolization induced liver disease (REILD) in TARE studies. For HCC patients with CP-A liver function treated with TARE, multiple studies report OS greater than 15 months[46-48]. Many patients in these studies had significant tumor burdens, with multifocal disease, PVTT and median tumor diameters greater than 5 cm. Table 2 summarizes prospective trials showing TARE as an excellent option for tumor control in high-volume and multifocal HCC. In the treatment of unresectable primary liver cancer, TARE’s clinical applications range from palliation to transplant bridging. TARE can treat HCC in the setting of PVTT, whereas reduced main portal vein flow is a contraindication to TACE[47,49]. Mild TARE-related syndromes are commonly reported after treatment of HCC, such as fatigue, abdominal pain, nausea, vomiting, and low-grade fever. Adverse events grade 3 or greater include 10% biliary toxicity 2%-13% REILD and 5.8%-23% bilirubin elevation[50,51]. While randomized studies show that Y-90 radioembolization significantly prolongs time to HCC progression compared with TACE, grade 3 or higher toxicity rates are comparable between TARE and TACE[46-49]. Dosimetric software, providing accurate assessment of the dose delivered to tumor and adjacent normal liver tissue during TARE procedures, has recently been FDA approved (Hermes Medical Solution). Better assessment of dose delivered to tumor tissue and uninvolved liver may permit strategies combining both SABR and TARE in selected situations or may allow for better comparisons and selection between the two techniques for individual patients. HCC tumors are somewhat resistant to cytotoxic and targeted therapies due to compromised metabolism caused by underlying liver disease. For patients with advanced HCC, sorafenib is the first line agent, with a partial response rate of 2% and a rate of stable disease driving prolonged survival in the multicenter European SHARP trial. For previously untreated patients receiving sorafenib, clinical trials have shown a median OS of 10.7 months vs. 7.9 months with placebo. The REFLECT study comparing lenvatinib to sorafenib demonstrated lenvatinib to be non-inferior as a first line agent in the treatment of HCC, with an overall response rate of 24.1% for lenvatinib vs. 9.1 % for sorafenib. Lenvatinib was approved by the FDA for frontline HCC in August 2018. Oncologists managing HCC continue to look for alternative treatments and there is growing interest in immune based therapies. The host immune system’s inability to reject tumor during cancer development may represent failure at any step in the immune regulatory process. As a result, any host immune system regulatory element is a potential target for systemic treatment. Checkpoint antibodies such as pembrolizumab, ipilimumab and nivolumab have demonstrated clinical activity against melanoma, non-small cell lung cancer, Hodgkin’s lymphoma, and renal cell carcinoma. Checkpoint antibodies also demonstrate antitumor effects in the treatment of advanced HCC[56,57]. In November 2018, the FDA granted accelerated approval to pembrolizumab for patients with HCC previously treated with sorafenib, based on results of the KEYNOTE-224 trial. In that single arm multicenter trial, 104 CP-A patients who had already received or were intolerant to sorafenib were treated with pembrolizumb and had an overall response rate of 17%. While duration of response may be prolonged, the response rates with checkpoint antibodies are generally 20% or less, contributing to growing interest in strategies that combine local treatments to amplify tumor immunogenicity. Cancer cell apoptosis induced by the delivery of high dose per fraction radiation releases tumor fragments into the tumor microenvironment and can stimulate the host immune response. Over 25 ongoing clinical trials are evaluating the combined use of SABR and systemic immunotherapy agents for different disease sites. Conventional EBRT is known to be immunosuppressive. Large treatments fields can damage adjacent bone marrow stem cells and kill circulating blood cells. SABR is directed to a much smaller field, minimizing normal cell exposure while inducing proinflammatory tumor cell death. Cell death by apoptosis exposes tumor antigen and stimulates innate and adaptive immune responses. Studies show increased myeloid and lymphocytic infiltration of tumor following dose-escalated radiation. The hypothesis that ablated tissue can act as an in-situ vaccine through tumor necrosis factor-α (TNF-α) and T-cell stimulation matured from case reports describing an abscopal effect, where tumor regression was observed outside of the treatment field following local irradiation. The clinical significance of the abscopal effect remains hypothetical with limited supportive clinical data to date. In HCC, preclinical models report positive results for combined radiation and checkpoint blockade. 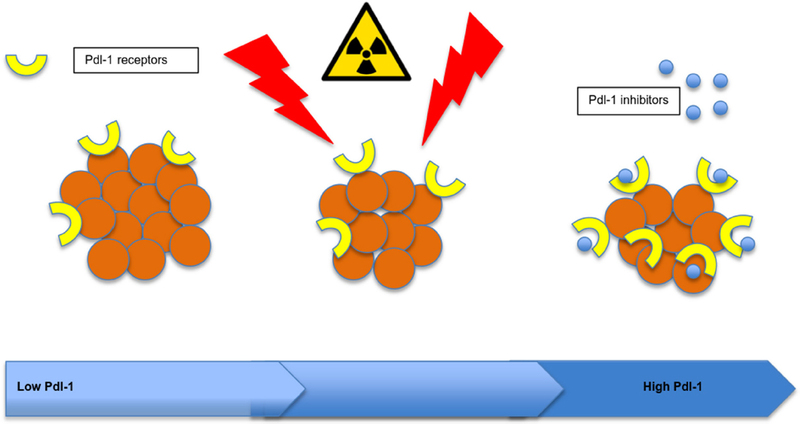 Radiation upregulates programmed death ligand 1 (PD-L1) expression, and tumors treated with combination radiation plus anti-PD-L1 inhibitors had significantly greater results than radiation or immunotherapy alone. Gustafson et al. in 2017 reviewed peripheral blood immunophenotypes in a series of patients with liver cancer before and after the administration of SABR. A 50% drop in peripheral CD3+ T-cells was observed, suggesting that T-cells were trafficking to tumor and lymph nodes both at the target site and possibly to disease outside of the treatment field. A recent clinical study by Kim et al. shows that PD-L1 expression is elevated following SABR treatment of HCC, similar to effects identified in murine models. This phenomenon points to potential therapeutic benefit from combination treatment with a PD-L1 checkpoint inhibitor such as atezolizumab. Phase I/II clinical trials are underway evaluating SABR plus ipulimumab, a cytotoxic T-lymphocyte associated protein 4 (CTLA-4) inhibitor [Figure 2]. In summary, the combination of immunotherapy with SABR to treat advanced HCC is a novel strategy with promising potential. Historically, the risk of hepatic decompensation due to RILD has discouraged the use of radiotherapy to treat liver cancer. RILD triggers a fibrotic process leading to the obliteration of central venules and widespread venous congestion. Signs and symptoms can present in classical or non-classical patterns, developing between 2 weeks to 8 months after treatment. Outcomes vary from full recovery with supportive care to rare cases of liver failure and death. Improvements in normal tissue complications probabilities (NTCP) modeling and awareness of the liver’s parallel physiology provide the rationale for partial-liver irradiation to minimize the risk of RILD. A phase I trial of SABR in the treatment of liver metastases used partial hepatectomy outcome data to set volume parameters for normal tissue sparing. The trial reported no cases of RILD when 700 cm3 of uninvolved liver tissue were protected from doses exceeding 15 Gy in 3 fractions. Since then, NTCP modeling has established mean liver dose constraints reducing the risk of RILD to less than 5% in selected patients with CP-A hepatic function. In CP-A patients, prospective studies show a range of grade 3 or higher toxicities in 11%-30% of patients, almost all gastro-intestinal related [Table 1]. The highest number is from the PMH trial, in which patients had a greater than typical disease burden (average tumor size > 7 cm, 55% with PVTT, 12% with metastatic disease, all patients deemed untreatable by RFA, TACE or surgery). Patients most commonly complain of increased fatigue and poor appetite, usually resolving by 3 weeks after completion of their radiation course. Non-RILD toxicities, such as gradual liver decompensation, moderately elevated liver enzymes or virus reactivation can also occur. For patients with advanced cirrhosis, tissue-sparing volumetrics and dose constraints may require reduction of the total dose prescribed. It is difficult to distinguish RILD from progressive liver disease, which can be multi-focal and out of the radiotherapy treatment field. For CP-B patients it may be reasonable to offer SABR when patients have no other option, though it must be done with caution. Non-critical use in inexperienced hands may result in toxicity. In 2015, a phase I/II trial reported 38% grade 3 or higher toxicities for CP-B HCC patients treated with SABR. Ablative dose escalation should be applied carefully among CP-B patients as RILD rates increase in this population and limited safety data exists. SABR is not recommended for patients with CP-C disease. Proper commissioning of all equipment involved in SABR treatment, comprehensive quality assurance programs and specialized training for all staff involved in planning and delivery are essential safeguards. SABR is a minimally-invasive treatment option for patients with non-metastatic HCC who are not candidate for resection or liver transplant. Published series show that this treatment approach is associated with excellent tumor control and can be done safely when NTCP guidelines are applied. In addition, SABR may have some immunomodulation effects. Many ongoing clinical trials are looking at innovative ways to combine hypofractionated radiation therapy with immunotherapy to potentiate the systemic treatment response. The authors would like to thank Dr. John Chetley Ford for his help in the preparation of the SART video. Dr. Eric A. Mellon received traveling support from ViewRay; Dr. Lorraine Portelance is a member of BTG compatibles Ready90 registry advisory board and dosimetry advisory board. She has received speaker support from BTG for talk on SABR; Dr. Lorraine Portelance received honorarium as a moderator in a ViewRay symposium. 1. WHO. WHO mortality database. Available from: http://www.who.int/healthinfo/mortality_data/en/. [Last accessed on 7 Jan 2019]. 2. White DL, Thrift AP, Kanwal F, Davila J, El-Serag HB. Incidence of hepatocellular carcinoma in all 50 United States, from 2000 through 2012. Gastroenterology 2017;152:812-20. 3. Bruix J, Sherman M; American Association for the Study of Liver Diseases. Management of hepatocellular carcinoma: an update. Hepatology 2011;53:1020-2. 4. Singal AG, Yopp AC, Gupta S, Skinner CS, Halm EA, et al. Failure rates in the hepatocellular carcinoma surveillance process. Cancer Prev Res (Phila) 2012;5:1124-30. 5. Trevisani F, De Notariis S, Rapaccini G, Farinati F, Benvegnù L, et al. Semiannual and annual surveillance of cirrhotic patients for hepatocellular carcinoma: effects on cancer stage and patient survival (Italian experience). Am J Gastroenterol 2002;97:734-44. 6. Bruix J, Llovet JM. Prognostic prediction and treatment strategy in hepatocellular carcinoma. Hepatology 2002;35:519-24. 7. Jarnagin W, Chapman WC, Curley S, D’Angelica M, Rosen C, et al. Surgical treatment of hepatocellular carcinoma: expert consensus statement. HPB (Oxford) 2010;12:302-10. 8. El-Serag HB. Epidemiology of hepatocellular carcinoma in USA. Hepatol Res 2007;37:S88-94. 9. Mazzaferro V, Regalia E, Doci R, Andreola S, Pulvirenti A, et al. Liver transplantation for the treatment of small hepatocellular carcinomas in patients with cirrhosis. N Engl J Med 1996;334:693-9. 10. Benson AB 3rd, D’Angelica MI, Abbott DE, Abrams TA, Alberts SR, et al. NCCN guidelines insights: hepatobiliary cancers, version 1.2017. J Natl Compr Canc Netw 2017;15:563-73. 11. Kothary N, Dieterich S, Louie JD, Chang DT, Hofmann LV, et al. Percutaneous implantation of fiducial markers for imaging-guided radiation therapy. AJR Am J Roentgenol 2009;192:1090-6. 12. Kishan AU, Cao M, Mikaeilian AG, Low DA, Kupelian PA, et al. Dosimetric feasibility of magnetic resonance imaging-guided tri-cobalt 60 preoperative intensity modulated radiation therapy for soft tissue sarcomas of the extremity. Pract Radiat Oncol 2015;5:350-6. 13. Eccles CL, Dawson LA, Moseley JL, Brock KK. Interfraction liver shape variability and impact on GTV position during liver stereotactic radiotherapy using abdominal compression. Int J Radiat Oncol Biol Phys 2011;80:938-46. 14. Ten Haken RK, Balter JM, Marsh LH, Robertson JM, Lawrence TS. Potential benefits of eliminating planning target volume expansions for patient breathing in the treatment of liver tumors. Int J Radiat Oncol Biol Phys 1997;38:613-7. 15. Wagman R, Yorke E, Ford E, Giraud P, Mageras G, et al. Respiratory gating for liver tumors: use in dose escalation. Int J Radiat Oncol Biol Phys 2003;55:659-68. 16. Dawson LA, Brock KK, Kazanjian S, Fitch D, McGinn CJ, et al. The reproducibility of organ position using active breathing control (ABC) during liver radiotherapy. Int J Radiat Oncol Biol Phys 2001;51:1410-21. 17. Law AL, Ng WT, Lee MC, Chan AT, Fung KH, et al. Treatment of primary liver cancer using highly-conformal radiotherapy with kV-image guidance and respiratory control. Radiother Oncol 2012;102:56-61. 18. Winter JD, Wong R, Swaminath A, Chow T. Accuracy of robotic radiosurgical liver treatment throughout the respiratory cycle. Int J Radiat Oncol Biol Phys 2015;93:916-24. 19. Wojcieszynski AP, Rosenberg SA, Brower JV, Hullett CR, Geurts MW, et al. Gadoxetate for direct tumor therapy and tracking with real-time MRI-guided stereotactic body radiation therapy of the liver. Radiother Oncol 2016;118:416-8. 20. Hong TS, DeLaney TF, Mamon HJ, Willett CG, Yeap BY, et al. A prospective feasibility study of respiratory-gated proton beam therapy for liver tumors. Pract Radiat Oncol 2014;4:316-22. 21. Hong TS, Wo JY, Yeap BY, Ben-Josef E, McDonnell EI, et al. Multi-institutional phase II study of high-dose hypofractionated proton beam therapy in patients with localized, unresectable hepatocellular carcinoma and intrahepatic cholangiocarcinoma. J Clin Oncol 2016;34:460-8. 22. Gandhi SJ, Liang X, Ding X, Zhu TC, Ben-Josef E, et al. Clinical decision tool for optimal delivery of liver stereotactic body radiation therapy: photons versus protons. Pract Radiat Oncol 2015;5:209-18. 23. Tao R, Krishnan S, Bhosale PR, Javle MM, Aloia TA, et al. Ablative radiotherapy doses lead to a substantial prolongation of survival in patients with inoperable intrahepatic cholangiocarcinoma: a retrospective dose response analysis. J Clin Oncol 2016;34:219-26. 24. Fode MM, Høyer M. Survival and prognostic factors in 321 patients treated with stereotactic body radiotherapy for oligo-metastases. Radiother Oncol 2015;114:155-60. 25. Chen X, Liu L, Pan X. Portal vein tumor thrombus in advanced hepatocellular carcinoma: a case report. Oncol Lett 2015;9:2495-8. 26. Xi M, Zhang L, Zhao L, Li QQ, Guo SP, et al. Effectiveness of stereotactic body radiotherapy for hepatocellular carcinoma with portal vein and/or inferior vena cava tumor thrombosis. PLoS One 2013;8:e63864. 27. O’Connor JK, Trotter J, Davis GL, Dempster J, Klintmalm GB, et al. Long-term outcomes of stereotactic body radiation therapy in the treatment of hepatocellular cancer as a bridge to transplantation. Liver Transpl 2012;18:949-54. 28. Andolino DL, Johnson CS, Maluccio M, Kwo P, Tector AJ, et al. Stereotactic body radiotherapy for primary hepatocellular carcinoma. Int J Radiat Oncol Biol Phys 2011;81:e447-53. 29. Organ LW. Electrophysiologic principles of radiofrequency lesion making. Appl Neurophysiol 1976- 1977;39:69-76. 30. Eisele RM. Advances in local ablation of malignant liver lesions. World J Gastroenterol 2016;22:3885-91. 31. Llovet JM, Real MI, Montaña X, Planas R, Coll S, et al. Arterial embolisation or chemoembolisation versus symptomatic treatment in patients with unresectable hepatocellular carcinoma: a randomised controlled trial. Lancet 2002;359:1734-9. 32. Lencioni R, Petruzzi P, Crocetti L. Chemoembolization of hepatocellular carcinoma. Semin Intervent Radiol 2013;30:3-11. 33. Sapisochin G, Barry A, Doherty M, Fischer S, Goldaracena N, et al. Stereotactic body radiotherapy vs. TACE or RFA as a bridge to transplant in patients with hepatocellular carcinoma. An intention-to-treat analysis. J Hepatol 2017;67:92-9. 34. Su TS, Liang P, Liang J, Lu HZ, Jiang HY, et al. Long-term survival analysis of stereotactic ablative radiotherapy versus liver resection for small hepatocellular carcinoma. Int J Radiat Oncol Biol Phys 2017;98:639-46. 35. Parikh ND, Waljee AK, Singal AG. Downstaging hepatocellular carcinoma: a systematic review and pooled analysis. Liver Transpl 2015;21:1142-52. 36. Yao FY, Mehta N, Flemming J, Dodge J, Hameed B, et al. Downstaging of hepatocellular cancer before liver transplant: long-term outcome compared to tumors within Milan criteria. Hepatology 2015;61:1968-77. 37. Yopp AC, Mansour JC, Beg MS, Arenas J, Trimmer C, et al. Establishment of a multidisciplinary hepatocellular carcinoma clinic is associated with improved clinical outcome. Ann Surg Oncol 2014;21:1287-95. 38. Steel GG, Peckham MJ. Exploitable mechanisms in combined radiotherapy-chemotherapy: the concept of additivity. Int J Radiat Oncol Biol Phys 1979;5:85-91. 39. Wahl DR, Stenmark MH, Tao Y, Pollom EL, Caoili EM, et al. Outcomes after stereotactic body radiotherapy or radiofrequency ablation for hepatocellular carcinoma. J Clin Oncol 2016;34:452-9. 40. Sapir E, Tao Y, Schipper MJ, Bazzi L, Novelli PM, et al. Stereotactic body radiation therapy as an alternative to transarterial chemoembolization for hepatocellular carcinoma. Int J Radiat Oncol Biol Phys 2018;100:122-30. 41. Bujold A, Massey CA, Kim JJ, Brierley J, Cho C, et al. Sequential phase I and II trials of stereotactic body radiotherapy for locally advanced hepatocellular carcinoma. J Clin Oncol 2013;31:1631-9. 42. Kang JK, Kim MS, Cho CK, Yang KM, Yoo HJ, et al. Stereotactic body radiation therapy for inoperable hepatocellular carcinoma as a local salvage treatment after incomplete transarterial chemoembolization. Cancer 2012;118:5424-31. 43. Scorsetti M, Comito T, Cozzi L, Clerici E, Tozzi A, et al. The challenge of inoperable hepatocellular carcinoma (HCC): results of a single-institutional experience on stereotactic body radiation therapy (SBRT). J Cancer Res Clin Oncol 2015;141:1301-9. 44. Kennedy A, Nag S, Salem R, Murthy R, McEwan AJ, et al. Recommendations for radioembolization of hepatic malignancies using yttrium-90 microsphere brachytherapy: a consensus panel report from the radioembolization brachytherapy oncology consortium (REBOC). Int J Radiat Oncol Biol Phys 2007;68:13-23. 45. Johnson DT, Kesner AL. Yttrium-90 selective internal radiation therapy. In: Meyer J, Schefter T, editors. Radiation Therapy for Liver Tumors. Germany: Springer, Cham; 2017. 46. Hilgard P, Hamami M, Fouly AE, Scherag A, Müller S, et al. Radioembolization with yttrium-90 glass microspheres in hepatocellular carcinoma: european experience on safety and long-term survival. Hepatology 2010;52:1741-9. 47. Salem R, Gordon AC, Mouli S, Hickey R, Kallini J, et al. Y90 radioembolization significantly prolongs time to progression compared with chemoembolization in patients with hepatocellular carcinoma. Gastroenterology 2016;151:1155-63. 48. Sangro B, Carpanese L, Cianni R, Golfieri R, Gasparini D, et al. Survival after yttrium-90 resin microsphere radioembolization of hepatocellular carcinoma across Barcelona clinic liver cancer stages: a European evaluation. Hepatology 2011;54:868-78. 49. Menon KM, Khosla A, Trimmer CK. Principles of intra-arterial therapies. In: Meyer J, Schefter T, editors. Radiation Therapy for Liver Tumors. Germany: Springer, Cham; 2017. 50. Atassi B, Bangash AK, Lewandowski RJ, Ibrahim S, Kulik L, et al. Biliary sequelae following radioembolization with yttrium-90 microspheres. J Vasc Interv Radiol 2008;19:691-7. 51. Gil-Alzugaray B, Chopitea A, Iñarrairaegui M, Bilbao JI, Rodriguez-Fraile M, et al. Prognostic factors and prevention of radioembolization-induced liver disease. Hepatology 2013;57:1078-87. 52. Lasley FD, Mannina EM, Johnson CS, Perkins SM, Althouse S, et al. Treatment variables related to liver toxicity in patients with hepatocellular carcinoma, Child-Pugh class A and B enrolled in a phase 1-2 trial of stereotactic body radiation therapy. Pract Radiat Oncol 2015;5:e443-9. 53. Llovet JM, Ricci S, Mazzaferro V, Hilgard P, Gane E, et al. Sorafenib in advanced hepatocellular carcinoma. N Engl J Med 2008;359:378-90. 54. Hiraoka A, Kumada T, Kariyama K, Takaguchi K, Itobayashi E, et al. Therapeutic potential of lenvatinib for unresectable hepatocellular carcinoma in clinical practice: multicenter analysis. Hepatol Res 2018; doi: 10.1111/hepr.13243. 55. Kang J, Demaria S, Formenti S. Current clinical trials testing the combination of immunotherapy with radiotherapy. J Immunother Cancer 2016;4:51. 56. Sangro B, Gomez-Martin C, de la Mata M, Iñarrairaegui M, Garralda E, et al. A clinical trial of CTLA-4 blockade with tremelimumab in patients with hepatocellular carcinoma and chronic hepatitis C. J Hepatol 2013;59:81-8. 57. El-Khoueiry AB, Sangro B, Yau T, Crocenzi TS, Kudo M, et al. Nivolumab in patients with advanced hepatocellular carcinoma (CheckMate 040): an open-label, non-comparative, phase 1/2 dose escalation and expansion trial. Lancet 2017;389:2492-502. 58. Food and Drug Administration. FDA grants accelerated approval to pembrolizumab for hepatocellular carcinoma. Available from: https://www.fda.gov/Drugs/InformationOnDrugs/ApprovedDrugs/ucm625705.htm. [Last accessed on 7 Jan 2019]. 59. Zhu AX, Finn RS, Edeline J, Cattan S, Ogasawara S, et al. Pembrolizumab in patients with advanced hepatocellular carcinoma previously treated with sorafenib (KEYNOTE-224): a non-randomised, open-label phase 2 trial. Lancet Oncol 2018;19:940-52. 60. Haikerwal SJ, Hagekyriakou J, MacManus M, Martin OA, Haynes NM, et al. Building immunity to cancer with radiation therapy. Cancer Lett 2015;368:198-208. 61. Chen L, Narang A, Thompson E, Anders R, Waters K, et al. Characterizing tumor infiltrating lymphocytes following neoadjuvant chemotherapy and radiation in pancreatic adenocarcinoma. Int J Radiat Biol Phys 2017;99:S91-2. 62. Reese AS, Feigenberg SJ, Husain A, Webb TJ, Hausner PF, et al. Stereotactic ablative radiotherapy (SABR): impact on the immune system and potential for future therapeutic modulation. Mol Cell Pharmacol 2013;5:19-25. 63. Kim KJ, Kim JH, Lee SJ, Lee EJ, Shin EC, et al. Radiation improves antitumor effect of immune checkpoint inhibitor in murine hepatocellular carcinoma model. Oncotarget 2017;8:41242-55. 64. Gustafson MP, Bornschlegl S, Park SS, Gastineau DA, Roberts LR, et al. Comprehensive assessment of circulating immune cell populations in response to stereotactic body radiation therapy in patients with liver cancer. Adv Radiat Oncol 2017;2:540-7. 65. Schefter TE, Kavanagh BD, Timmerman RD, Cardenes HR, Baron A, et al. A phase I trial of stereotactic body radiation therapy (SBRT) for liver metastases. Int J Radiat Oncol Biol Phys 2005;62:1371-8. 66. Pan CC, Kavanagh BD, Dawson LA, Li XA, Das SK, et al. Radiation-associated liver injury. Int J Radiat Oncol Biol Phys 2010;76:S94-100. 67. Benedict SH, Yenice KM, Followill D, Galvin JM, Hinson W, et al. Stereotactic body radiation therapy: the report of AAPM task group 101. Med Phys 2010;37:4078-101. 68. Cárdenes HR, Price TR, Perkins SM, Maluccio M, Kwo P, et al. Phase I feasibility trial of stereotactic body radiation therapy for primary hepatocellular carcinoma. Clin Transl Oncol 2010;12:218-25. 69. El Fouly A, Ertle J, El Dorry A, Shaker MK, Dechêne A, et al. In intermediate stage hepatocellular carcinoma: radioembolization with yttrium 90 or chemoembolization? Liver Int 2015;35:627-35. 70. Salem R, Lewandowski RJ, Mulcahy MF, Riaz A, Ryu RK, et al. Radioembolization for hepatocellular carcinoma using yttrium-90 microspheres: a comprehensive report of long-term outcomes. Gastroenterology 2010;138:52-64.